In this guide, we will explain how to setup GitHub integration to track form template changes. If you have any questions, please email us support@solutionrock.com. You can use an existing GitHub account or register for a new one at https://github.com. You will need to create a new GitHub repository and generate a security token. Please use the following guide to generate a personal access token - https://help.github.com/en/articles/creating-a-personal-access-token-for-the-command-line. When you have the Github repository URL and Token available you can update your Formyoula account with the details. Paste in the Github Repository URL and Github Access Token. Please click Update Organisation when done. Now, every time you create or update a form template, the changes will be reflected and tracked on your Github Repository. We can test this by creating a new form. And then visiting our Github Repository to see the form template metadata. When you make changes to your form, Formyoula will create new commits to the form template in your GitHub repository. For example, showing that a new email field has been added to the form. 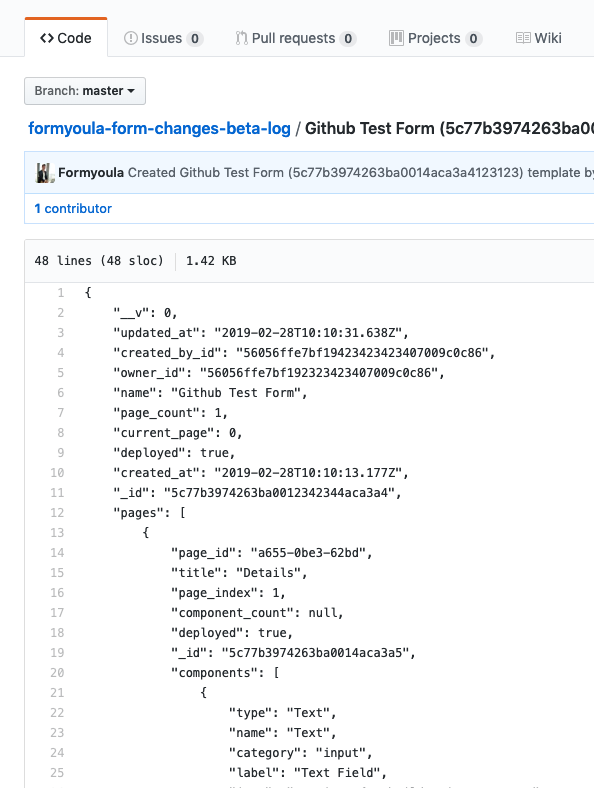 Each Formyoula form update will be recorded in your GitHub repository and the user making the change will be highlighted in the commit comments.